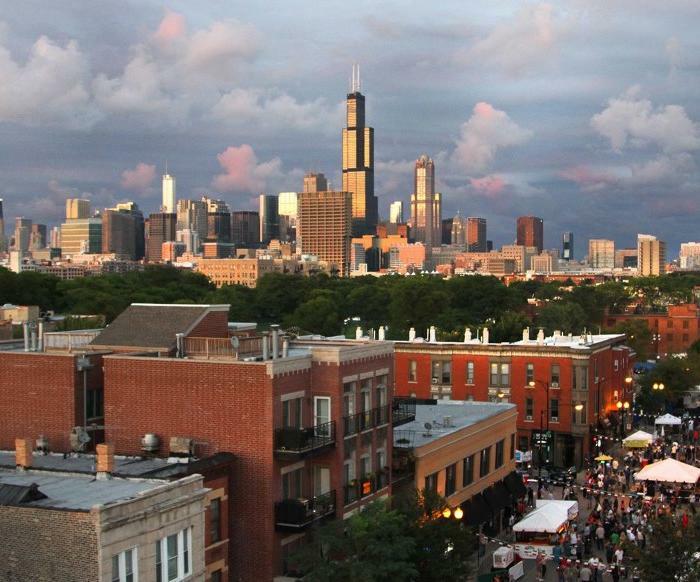 Before we venture into just four of Chicago&apos;s 77 diverse neighborhoods, here&apos;s a little about Taste of Chicago, the annual festival that is your ticket to savoring all four corners of the globe. The much anticipated, annual Taste of Chicago is not only one of the city&apos;s fave, world-focused foodie festivals, but also a melting pot of Chicago cultures represented through diverse food and music. Every July, restaurateurs from across the city set up shop in Grant Park (Jackson Blvd & Columbus Dr) for this food-centric festival, offering up delicious samples of their most popular dishes and giving guests the chance to taste the flavors of Chicago in one fun summer setting. Live entertainment rounds out the festivities. Though entrance to the Taste of Chicago is free, food and beverage tickets are sold in strips of 14 for $10 (includes $3 charge for Taste amenities). Smaller "Taste of Portions" are available at each food vendor. Whatever food ticket option you choose, there&apos;s no better way to savor so many restaurant offerings in just one afternoon. Plan on loosening your belt a few notches! Chicago&apos;s premier outdoor food festival runs July 11-15, 2018 in Grant Park. Hours are Wednesday-Friday, 11am-9pm; Saturday & Sunday, 10am-9pm. For more information, visit the City of Chicago&apos;s official Taste of Chicago website. The Mexican-American Pilsen neighborhood is best known for the beautiful, thought-provoking murals that adorn just about every once-blank space in this lower west-side neighborhood. They reflect the residents&apos; shared joys, sorrows, political concerns, memories and Latino culture. Set off on a self-guided tour of Pilsen&apos;s magnificent murals at the neighborhood&apos;s 18th Street Station, where Artist Francisco Mendoza created Las Mujeres (located on the exterior of the station on the east side of the entrance), a mosaic that celebrates the bold and beautiful women of Mexico, past and present. At 1401 W 18th St, the two-story The Declaration of Immigration created by artist Salvador Jimenez and a group of young students poignantly reminds viewers that we are a city and a nation of immigrants. The mural Gulliver En El País De Las Maravillas (1900 W Cullerton St) covers the studio home of its artist, Hector Duarte. Inspired by the eponymous novel, Gulliver&apos;s Travels, it depicts Gulliver not as a traveler in a new land but as a Mexican immigrant struggling to break free from a barbed wire fence and survive. These are just three of the many murals you&apos;re bound to encounter as you explore Pilsen. Cap off your tour with a visit to the Nuestras Historias exhibit at the National Museum of Mexican Art (852 W 19th St). This dynamic, permanent exhibit highlights the Mexican identity as seen through art past to present. And when your hunger and thirst take over, there&apos;s no limit to the options open to you. A couple to try: Dusek&apos;s (1227 W 18th St), a high-end gastropub experience within a hip, historic building, and Alulu Brewpub (2011 S Laffin St), a brewery and craft cocktail joint with a warehouse atmosphere. Pilsen is famed as an artist&apos;s haven, with artist studios dotted throughout. The second Friday of the month is Gallery Night, with opening receptions at galleries and artist studios centered around South Halsted Street, beginning at 1711 and ending at 2005 S. Halsted St. It&apos;s a great way to take in the atmosphere of the neighborhood, and immerse yourself in its culture. The Little Italy neighborhood is a living legacy of Chicago&apos;s Italian-American past. Here, food is culture and history remains engrained in stone — from the humble halls of the original settlement homes at Jane Addams Hull-House Museum (800 S Halsted St) to the vaulted ceilings of The Shrine of Our Lady of Pompeii (1224 W Lexington St) and the beautiful Notre Dame de Chicago (1334 W Flournoy St), built in 1892 by French Canadian architect Gregoire Vigilant. This is one of the few remaining French landmarks in Chicago, and was added to the National Register of Historic Places in 1979. Head straight to Taylor Street, from Morgan Street west to Ashland Avenue, to feel the true pulse of the neighborhood. Here, you&apos;ll find restaurants and delis that span generations. Mario&apos;s Italian Lemonade (1066 W Taylor St, open from May) is a curbside stand that has been serving up shaved ice since the 1950s. At Conte Di Savoia (1438 W Taylor St), you&apos;ll find an old-world Italian deli that&apos;s been serving the neighborhood since 1948. Rustic Italian small plates and oodles of wine are the specialty at Davanti Enoteca Taylor Street (1359 W Taylor St). And at Tuscany on Taylor (1014 W Taylor St), you&apos;ll find Italian wines and Tuscan-inspired seafood served in a stylish trattoria. Before you fill up on authentic Italian cuisine, pay a visit to the National Italian American Sports Hall Of Fame (1431 W Taylor St), a three-story museum founded in 1977 to house exhibits of Italian-American sports champions. If you&apos;re planning to visit this fall, make sure the new Chicago Music Hall of Fame (1431 W Taylor, above the National Italian American Sports Hall of Fame) is also on your sightseeing list. From Chaka Khan and Chance The Rapper to the Buckinghams and Benny Goodman, Chicago has left an indelible mark on the music industry. The Chicago Music Hall of Fame is committed to documenting that legacy in all its glory. Little Italy is also home to Chicago helicopter tour operator Vertiport. If you&apos;re looking for a thrill ride, the sky&apos;s the limit here — literally. Another worthwhile stop is the nearby Maxwell Street Market, where bargains and bargaining reign. You&apos;ll find a little of everything at this international-styled market, from tools to tires, and fresh produce to collectibles. It runs every Sunday, year round, from 7am-3pm on Desplaines from Polk to Taylor streets (admission is free). 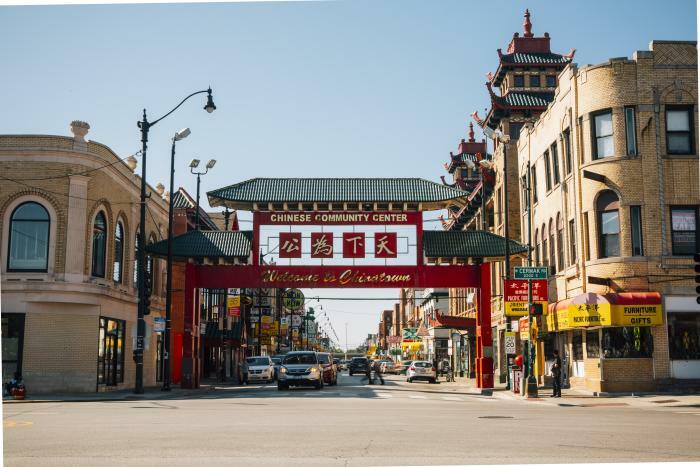 Centered on Cermak and Wentworth Avenues, Chicago&apos;s century-old Chinatown transports visitors to the East, thanks to the many Chinese-American grocery stores, boutiques. cafes and restaurants that line these elaborately adorned streets. Start your visit at the newer, outdoor Chinatown Square Mall (2133 S China Pl), located just north of the main Wentworth Avenue District, where numerous cafes and boutiques are gathered in a pedestrian-friendly open-air environment. See if you can spot your sign among the 12 Chinese Zodiac statues located in the middle of the mall. Bright, colorful Joy Yee&apos;s (2139 S China Pl) makes for the perfect lunch spot; don&apos;t miss Joy Yee&apos;s specialty, Bubble Tea, aka. Boba Tea, a fruit-flavored drink dotted with tapioca pearls. Head to Chinatown&apos;s original stretch and pick up some treats at the neighborhood&apos;s oldest bakery, Chiu Quon (2253 S Wentworth Ave), where old-school Chinese-American pastries — savory BBQ pork buns, sweet coconut custard buns, and lotus bean paste mooncakes — fly off the shelves daily. Wash down the deliciousness with a Yin Yang (half coffee, half milky tea). For a truly special dinner or dim sum experience, head to MingHin Cuisine (2168 S Archer Ave), awarded the 2018 Michelin Bib Gourmand for the third consecutive year. And if you&apos;re in the mood for something a little more casual, Strings Ramen Shop (2141 S Archer Ave) offers up all varieties of ramen soups and rice bowls in a low-key environment with patio. Stretching the east side of the Chicago River in Chinatown, Ping Tom Park (300 W 19th St) is a community treasure. Its shady playground and open, grassy area make for a perfect picnic spot, with the city skyline as a stunning backdrop. Interspersed among the West Loop&apos;s luxe lofts and chic boutiques you&apos;ll find Greektown, lined with Hellenic bakeries, energetic tavernas and family-owned restaurants that beckon you to channel the Greek within in. At the northern edge of Greektown&apos;s Halsted Avenue, the National Hellenic Museum (333 S Halsted St) connects visitors to the history of the Greek immigrant, while showcasing Greek culture through an extensive collection of artifacts spanning thousands of years of Greek history. The museum’s HOMER Oral History Project is the largest national effort to record the Greek immigrant experience in America via interviews and recordings. The museum also offers Greek language and culture classes, as well as a weekly bilingual story hour for children. Greek Islands (200 S Halsted St) is among the many dining stops you&apos;ll find here, serving all the iconic Greek-American favorites, including Chicago-invented flambéed Saganaki. 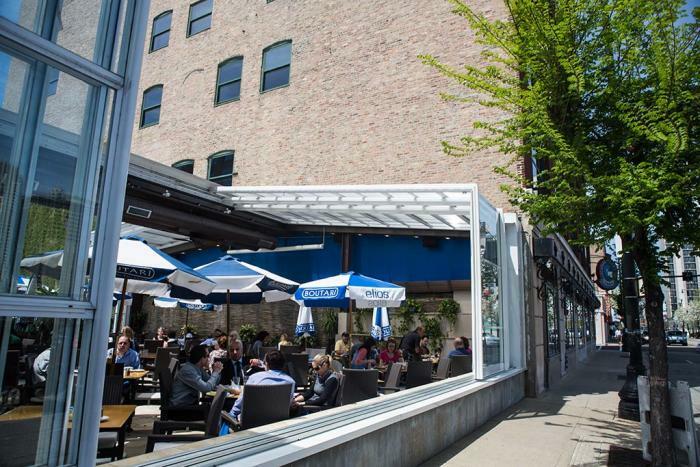 Take a stroll to Athena (212 S Halsted St, pictured above), grab a seat on the patio and sample every Hellenic delicacy imaginable. No trip to Greektown is complete without a visit to Artopolis (306 S. Halsted St.), a cafe with an in-house bakery. Try the Galaktoboureko, a traditional milk custard with a hint of orange blossom, encased in a buttery phyllo shell. Strong Greek coffee and tea are always at the ready.